These screenshots show KakaoTV, a video feature for chatrooms on KakaoTalk, the dominant messaging app in South Korea. Dominant South Korean chat app KakaoTalk is getting a new feature in which users can view streaming videos together, including live sports broadcasts. KakaoTV is a bit like a virtual TV in a virtual living room. It lets users view and share videos in KakoTalk chat rooms while they comment on what's being watched. The videos appear above users' conversations. App developer Daum Kakao will offer hundreds of thousands of clips from South Korea's main terrestrial broadcasters, cable channels and other content providers. The material will include previews for dramas; variety shows; music videos, and sports. "Rather than competing with other video-streaming services, we believe this is another effort for discovering a new way of consuming video content on mobile," a Daum Kakao spokeswoman said via email. 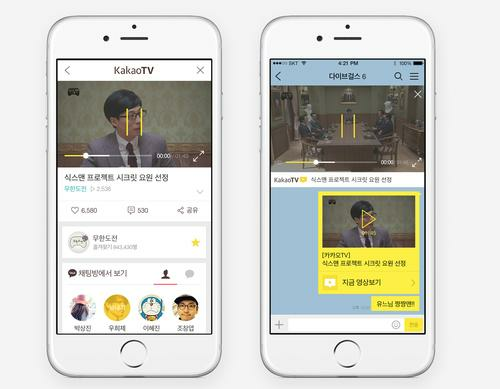 KakaoTV also recommends videos based on what users have seen or videos seen by their friends. The company also announced an Android and iOS video chat service, Video Call, that's similar to the ones available on Facebook or Skype, except for the addition of camera filters that can "beautify" the appearance of users. That feature may boost demand for video chat, which has been low in South Korea, according to the firm. Daum Kakao claims about 180 million subscribers to KakaoTalk worldwide, led by South Korea, where it claims 97 percent of all smartphone users. Its second-largest market is Indonesia. The company does not disclose the number of active users or regional breakdowns of its user base. KakaoTV will only be released in South Korea for the time being, and the country has been a test bed for Daum Kakao services. It managed to launch a ride-hailing service, Kakao Taxi, even though rival Uber Technologies has faced strong resistance and probes from the Korean government. Daum Kakao has tried to expand its international footprint with the recent acquisition of Path, a privacy-oriented social network based in San Francisco, which added 10 million users, especially in Indonesia.